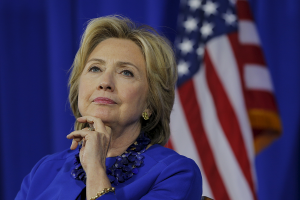 MANCHESTER, N.H. — Days after a deadly shooting in Oregon, Hillary Rodham Clinton unveiled new gun control measures Monday aimed at strengthening background checks on gun buyers and eliminating legal immunity for sellers. During a daylong campaign swing through New Hampshire, Clinton proposed a repeal of legislation that shields gun manufacturers, distributors and dealers from most liability suits, even in the case of mass shootings like the one that killed nine people at a community college on Thursday. Clinton has made strengthening gun laws a centerpiece of her presidential campaign, vowing she would use her executive power as president to expand background checks for sellers at gun shows and online and back legislation banning domestic abusers from purchasing guns. She also backed congressional efforts to stop retailers from selling guns to people with incomplete background checks, as happened when Dylann Roof, the man charged in the Charleston church shooting, bought his gun. The plan marks an effort by Clinton to stake out liberal ground against her closest rival, Vermont Sen. Bernie Sanders. While Sanders has wooed the Democratic base with his liberal positions on issues like income inequality and college debt, he’s struggled to defend a more mixed record on gun legislation — a reflection, he says, of his rural, gun-friendly home-state. After the Sandy Hook Elementary School shooting in 2013, Sanders backed all the Democratic gun bills brought up in Congress. But in 1993, he voted against the landmark Brady handgun bill, which imposed a five-day waiting period for gun purchasers, and he backed the 2005 legislation granting legal immunity to many in the gun industry. Sanders now says he supports banning assault weapons and closing the so-called “gun show loophole” that exempts private, unlicensed gun sales from background checks. But she said she wasn’t surprised by his recent rise in New Hampshire polls, mentioning his long tenure representing a neighboring state. Clinton has emerged as one of the fiercest proponents of tougher gun control after a series of shootings over the past several months has reignited debate over gun laws in the presidential campaign.